Birds, especially pigeons and their nests are on the increase as a pest within homes and gardens around Stoke on Trent. We supply a pest control service to help you rid of this type of vermin and the removal of any nests. Bird control is now required everywhere as their faeces represent both an aesthetic and a public health problem. This is particularly so when birds obtain access to the interior of a building. Pigeon droppings quickly deface finishes both to the inside and outside of buildings and are difficult and expensive to remove. Bird and predominatly pigeon activity in and around a building may directly damage the structure as pigeons are capable of lifting roof coverings to force an entry, especially if these are already slightly displaced. This activity can allow significant water penetration into the building and subsequent decay. More seriously, they block rainwater drainage systems with their faeces, feathers and other detritus. This can cause massive water penetration and severe decay problems. Nesting activity is particularly dangerous in this respect as pigeons frequently nest in hopperheads and parapet gutters causing complete blockage in a very short time. This disruption of drainage and the resultant water penetration is especially damaging in unoccupied buildings where problems are less likely to be detected before major damage has been done. The results of water penetration are also more serious as there may already be serious damp and decay problems in the buildings. Bird activity of this sort can thus negate the effect of conservation and remedial work. This represents a considerable waste of time and money, and may lead to the degradation and loss of valuable building features. Though they are actively fed and encouraged by many members of the public, pigeons and other birds represent a public nuisance as well as a health hazard. This may be because of disturbance caused by calling or nesting activity in the early hours, by spreading of fleas and other parasites into inhabited buildings and by pestering for food. However, the most resented nuisance is caused by faeces. This is a potential problem where arches or ledges projected over public areas. Further problems might be expected if the pigeons are allowed to occupy scaffolding to be erected around a building. The presence of birds, (usually pigeons) and most especially their faeces represents a potential health hazard to employees and to the general public. This is particularly so when large accumulations of filth build up inside a building. They are commonly carriers of a number of serious human diseases including salmonellosis, psittacosis and pseudo-tuberculosis. Their faeces provide an ideal environment for the growth of the organisms causing such diseases as histoplasmosis, aspergillosis, cryptococcis and listeriosis. 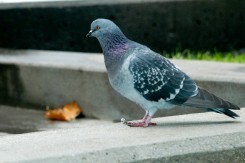 Although the risk of infection from pigeons may be relatively low, the diseases are severe and may be life threatening. Pigeon faeces represent a health and safety hazard for employees who have to remove them or work in their vicinity. They are thus a special problem in the renovation of buildings where large accumulations have been allowed to build-up. From the above it can be appreciated that if measures are not taken to minimise pigeon activity around a building their presence will cause significant problems for building management and maintenance. At Town and Country Pest Control there several methods we can use to identify and eradicate a bird that is a pest. Food reduction - This is the most successful long term measure for controlling absolute numbers of birds in an area. During the Second World War, reduction of food availability dramatically reduced the numbers of pigeons despite the increase in suitable nesting and roosting sites. Poisons and narcotic baits - Poisons can provide an effective control especially those producing a period of deranged behaviour before death. However the poisoning of birds is illegal in the UK. Trapping - Pigeons may be caught in live traps after a short period of baiting. A large proportion of a flock feeding in a given area can be removed by this technique. Traps require a private area for operation and regular attention by an experienced operator. The problem of this technique and others that involve the removal of birds from an area without reducing the suitability of the environment is that other birds will soon move in from adjacent areas. Birth control and removal of nest sites - Baits impregnated with birth control agents can be used but have limited uses as decreases in reproduction are made up by increased recruitment of birds from other areas. Removal of nest sites reduces reproduction but more importantly obliges breeding birds to leave the area. Nesting activity is a major source of the detritus blocking drainage around the building. Shooting - Shooting using an air gun may not significantly affect pigeon population. However, it is an effective method of scaring the birds away from a location. If carried out regularly at the time birds are settling for the night, it will prevent a roost being established at that location. Predators - Falcons and other raptors are used successfully to clear birds from feeding sites such as airfields and other buildings. When threatened by a raptor, pigeons tend to cower into their roosts rather than fly away but this method will control any extra build up of the pigeon population. Domesticated carnivores such as mink, polecats or cats will kill individual birds. More significantly, they will disturb the birds in those areas where they hunt, preventing roosting, resting and nesting. Bird scarers - Bird scarers may be visual, audio, mechanical or a combination. They work by producing a stimulus that is perceived as frightening the pigeons. Unfortunately, they have proved generally ineffective for this species due to its great adaptability and learning powers. Unless reinforced by actual pigeon deaths, they soon learn to ignore alarming sights and sounds. Appropriate reinforcement may involve killing pigeons and displaying their carcasses. The use of recorded alarm calls is also ineffective in this species. Bird nets - Fine, standard large mesh plastic nets are used to exclude pigeons from areas of a building. They may be used in large sections to wall off whole areas or in small strips to prevent pigeon access to individual features. Fixing should be by stainless steel pins and wires. Colour is generally black to reduce decay of the plastic by ultra violet sunlight. Netting is a very effective and economical way of preventing pigeon damage on a building, but may have the following problems: netting may give a hazy appearance to buildings with finely detailed decoration and it may be obtrusive on light or brightly coloured buildings. The use of netting in small sections requires relatively high numbers of fixing points and it has a life of five to ten years. Sprung wires - Stainless steel wire may be mounted on thin stainless steel brackets via short springs of the same material. These are placed a few inches above ledges at an appropriate height to interfere with landing and take-off by the pigeons. This is especially useful on narrow ledges and very cost effective where long straight runs of a few metres can be laid. Such wiring is unobtrusive, is easily removed and replaced for maintenance work, and has a life of at least ten years. Spikes - Several different systems of stainless steel or plastic spikes are available for fitting to buildings to discourage pigeons from landing. Although some of these are quite effective they suffer from a number of problems; sharp steel spikes are very dangerous to maintenance personnel, litter may become caught on the spikes, build-up of faeces makes them ineffective, their appearance may be unattractive, they are relatively expensive and they may require more fixing points than nets or wires.